Extend from $.fn.combo.defaults and $.fn.tree.defaults. Override defaults with $.fn.combotree.defaults. 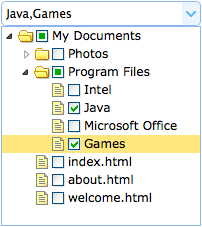 The combotree combines the selection control with drop-down tree. It is similar to combobox but replace the list with tree component. The combotree supports a tree with tree-state checkboxes for convenient multiple selection. The properties extend from combo and tree, below is the overridden properties for combotree. The events extend from combo and tree. The methods extend from combo, below is the added and overridden methods for combotree. tree none Return the tree object. The example below shows how to get the selected tree node. loadData data Load the locale tree data. reload url Request the remote tree data again. Pass the 'url' parameter to override the original URL value. setValue value Set the component value. The value can be the node's 'id' value, or the 'id' and 'text' pairs. If the node's 'id' value does not exists in the tree, the 'text' property value will be used to display on the textbox.